Thanks very much for subscribing to SCUBA News. I hope you find the newsletter useful - you can download a pdf version here. But there is also has good diving closer to the coast. With bull sharks at Bat Island and mantas, white tip sharks and eagle rays at Catalina Islands. 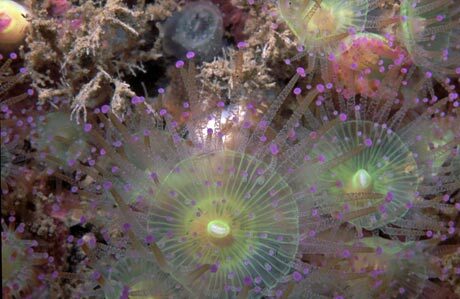 When divers first visit UK seas they are often amazed at the diversity and abundance of life. There are also a multitude of wrecks. Who to dive with in the Philippines? 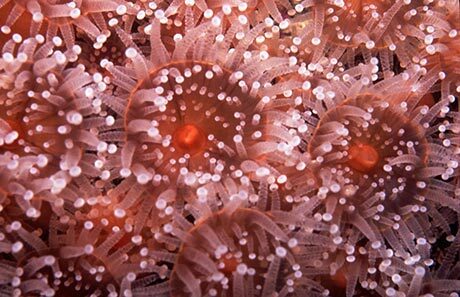 When a myriad of colour patches cover a rock it may well be because of jewel anemones (Corynactis species). These flower-like animals, up to 2.5 cm (1") across, feed on invertebrates which they have paralysed with nematocysts and caught with their 100 ball-tipped tentacles. 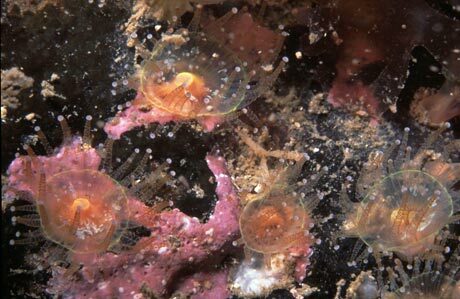 They favour fast-flowing water, so look for them where strong currents occur from shore level down to around 50 m.
The reason for the large patches of jewel anemones is their capacity for asexual reproduction. The adult anemone splits itself longitudinally into two which when repeated forms large colonies. 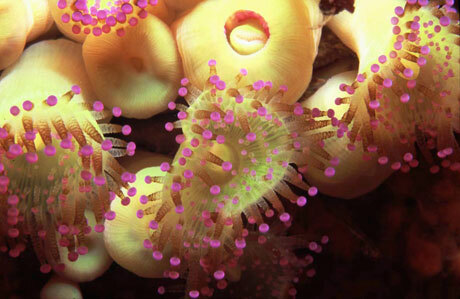 Different species of jewel anemones are found in temperate waters around the world. Corynactis viridis occurs around the British Isles, South West Europe and in the Mediteranean. 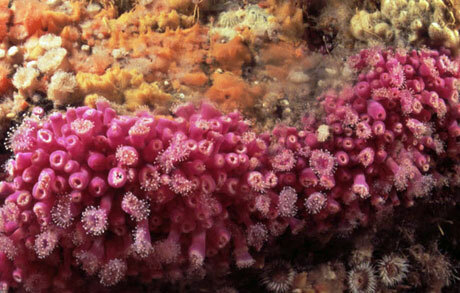 C. californica (also known as the strawberry anemone) is found from San Diego to British Columbia. C. autralis lives around South East Australia. Photo credits: Tim Nicholson. More of Tim's photos are on the SCUBA Travel website. Book by 28 August, travel until 28 February to the Caymans, Bahamas, Galapagos, Belize, Hawaii, Roatan, Turks & Caicos, Palau, Fiji, Thailand, Oman or the Red Sea. Plastic particles sink to the seabed after being eaten and excreted by animals called larvaceans, which could be why we see less floating plastic than expected. Pollution from mining activities may be encouraging some sea snakes to evolve black skins - the first evidence of "industrial melanism" in a marine species. Study measures the effect of loud sounds on migrating humpback whales as concern grows as oceans become noisier. emphasises the risks of increasing industrial activity in areas like the Great Barrier Reef. A new study may prompt hand wringing among tuna lovers. When it comes to pollutant levels, researchers now say where your tuna was caught matters. Covering 70 percent of Earth's surface, the world's oceans are vast and deep. So vast, in fact, that nearly every coastal country has the potential to meet its own domestic seafood needs through aquaculture. In fact, each country could do so using a tiny fraction of its ocean territory.